Rodent proofing your home this winter. As the temperature dips, rodents love to warm up in your home’s nooks and crannies just as much as you do. But, there’s good news! You can keep these unwanted invaders out with a few simple housekeeping practices. Avoid providing a feast for hungry rodents by keeping your countertops and other surfaces clear of food and residue. Monitor for crumbs under counters, the fridge, and other appliances. In addition, ensure all of your food is stored in sealed containers to prevent easy access. An often-overlooked attractant is dog and cat food, a common draw for mice and rats. Remember to keep pet food sealed just as you do with your family’s food. To effectively keep rodents out of your home, it’s important to seal off any place that makes it possible for them to gain entry. Mice and rats are extremely adept at squeezing through very small gaps. A good rule of thumb to follow is to close off any opening larger than ¼-inch. Check window screens for any tears and repair them. Seal any cracks in walls or the foundation with wire mesh. Examine spots where pipes enter your home – if there are gaps, fill them with concrete. Do you burn wood in the winter to keep your homestead toasty warm? If you do, you probably keep a stockpile of lumber at the ready. Unfortunately, firewood is a favourite hideout for mice and rats. To remove rodent-friendly conditions, elevate your logs at least 18 inches off the ground. Also, be sure to store it away from your house. Adding a sweep or brush strip to your exterior doors is another great way to prevent rodents from entering your home. By blocking off the small gaps at the base, which are especially common with older doors, mice will have fewer ways to get inside. For easier installation, choose one with an adhesive strip rather than screws. As an added bonus, this manoeuvre will also save you money this winter by keeping the heat inside! 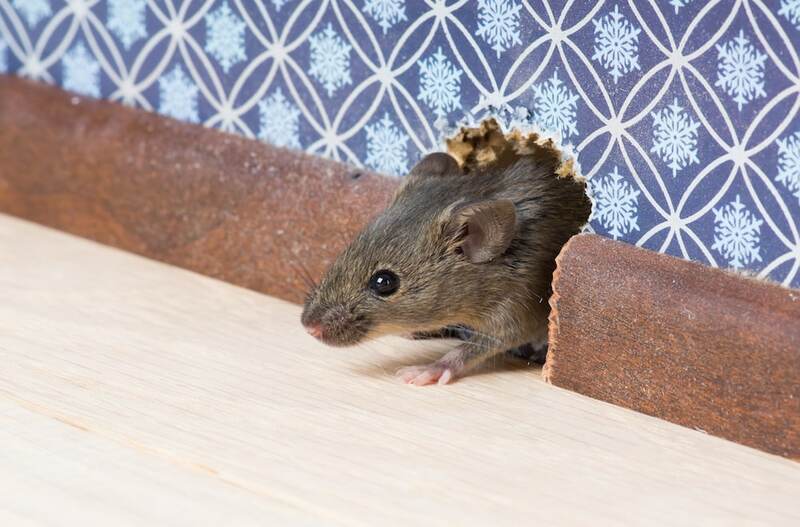 Mice and rats thrive in areas with clutter, which provide plenty of convenient hiding spots – especially in parts of the home that don’t serve as primary living space such as basements, attics, and garages. Some quick tidying can make these areas less tempting. Start by clearing out stacks of old newspapers and other junk. Also, pick up piles of laundry from the floors. Boxes clustered together can also be inviting, so make sure your stored items are organised and elevated off the ground. Before the weather gets too cold, perform appropriate yard maintenance. Trim any branches that hang close to your house as they could provide rats with easy access to your roof or attic. Tidy up any overgrown vegetation and remove weeds and leaf piles to ensure lurking rodents have fewer hiding places.